Manufacturer of a wide range of products which include automatic diamond chain cutting machine, single head vertical diamond chain cutting machine, double head chain cutting machine, chain cutting machine and fancy chain cutting machine. 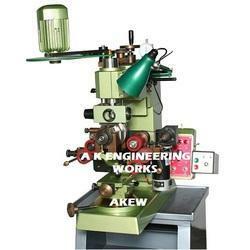 With the help of our experienced engineers, we are manufacturing and supplying Automatic Diamond Chain Cutting Machine. 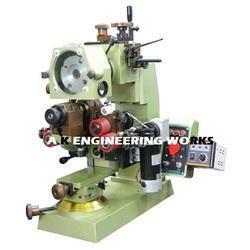 The offered range of machines is equipped with a single horizontal head. These machines have two Z-axis; one for cut depth adjustment and the other for automatic up-down movement of the chain. Model SH-H Auto is equipped with a Single Horizontal head. Ideal for Step up (Lines, Starts, V’s, Checks) on flat chains. Surfacing & Bevelling can also be done. Automatic cuts can be made at a pre-defined Angle, Depth, and Distance at a time. The machine consists of Two Z-Axis. One for cut depth adjustment and the other for automatic up-down movement of the chain. Moving the chain forward and Z-Axis Up-Down Motion is synchronization via cam system. The machine is complete with a Sturdy Base, Indexing Unit, Ø 110 Mm Revolving Clamping Discs, Vacuum Attachment For Gold Chips Recovery, Chain Winder With Bobbin (Optional), Magnifying Glass Attached To Machine, Depth Indicator Dial, Electric Panel Board, Service Spanners & Spare Belts. We are the manufacturer of Single Head Vertical Diamond Chain Cutting Machine. 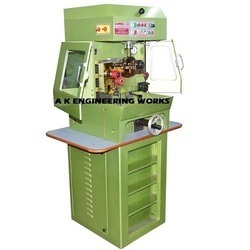 Backed by rich industry experience, we are manufacturing and supplying Double Head Chain Cutting Machine. To manufacture these machine models, we do not compromise with quality and make sure that qualitative material is brought into use. The products we offer are inspected on certain parameters of quality to rule out every possibility of defect. Model AR1000N comes with a Single interchangeable head. Suitable for Chamfers, Bevels, Background Dull on flat chains. 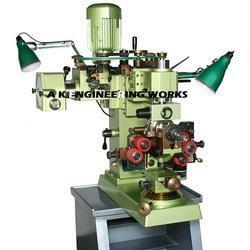 Vertical Head can be fitted with Horizontal Head. Switching between the two heads is manual and rapid. Horizontal Head can be laterally indexed. With the firm responsibility to quality, we are manufacturing and supplying a far-reaching scope of Chain Cutting Machine. Automatic 4 axis AKEW Model AK-NC4 chain cutting machine / chain faceting machine for flat chains with single or different designs simultaneously. - 4 Axis machine. - Work can be performed with both Horizontal and Vertical Heads. Switching between the two heads is manual and is extremely rapid. - 50+ Designs can be made on a 18 inch chain. - Extremely easy to use custom software provided for making designs. (No CNC type Coding Required). - Work cycle is performed in a closed environment, to allow recovery of residue. - NO AIR SUPPLY REQUIRED. The machine is complete with base, electric and electronic plant, LCD screen and keyboard, protection cover, service spanners and spare belts. Looking for Chain Cutting Machine ?